We'd all concur, I think, that it's been far too cold for far too long. Today's BBC weather for Ipswich, however, confidently predicted a double-digit temperature come late morning. By George Clothing, they were right. Not quite time for shorts as yet but no need to zip up that collar to the absolute top. A good day, then, to venture out on the velocipedes. Action Man Andy had spotted an 'andy sign, the type we like: New Cafe. Fifteen minutes for three miles, cutting through the Grange Farm psychopath then along Dr Watson's Lane onto the rat run that is Playford Road. 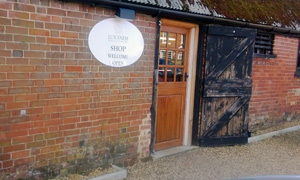 Left down the restfully rustic driveway into Lux Farm, home of "rare breed meats". There's been a farm shop here for a while. Now there's a cafe too, hoorah. Plain wooden tables, nicely compact -- reminded slightly of Isaacs -- and we're not the only ones here, another good sign. Good start with a well-stocked corner unit of Luscombe and James White juicy bevs. Tangy raspberry lemonade for me. Eager-to-please lady lists today's savoury options: passing over the ploughman's and sausage rolls, he has the curried parsnip soup (with a hunk of good bread from the Woodbridge bakery), I have the salf beef roll. That's some flavourful meat in there, helped by a serving of Nick Stokes' chutney and some mayo-enhanced side salad. Better than expected, already. Anything else, asks the lady? You bet. There is much cake, a happy sentence. Brownie? Bara brith? Flapjack? Like the sound of the lime marmalade cake. Dollop of double cream with that? Since we've cycled miles, why not. Far more calorie controlled portions than seen at Crabtrees recently. Very acceptable proppa cuppa coffee too. At the next-door shop we settle up then saddle up to re-enact part of last September's Tour of Britain, a briefly testing down and up the Hall Road dip past Milsoms. Glad that cake was the size it was. If it was a car -- Fiat Lux. If they were passing by -- Paul Heiney.